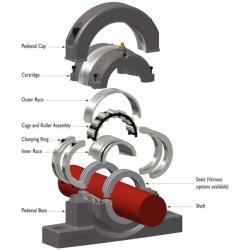 Shaft Bearings | Exalto Emirates LLC. Most Cooper split roller bearings are mounted in a cartridge. This is a spherically-machined inner housing that can be fitted into a number of outer housings including pedestals, flanges, rod-ends, take-up units and custom housings either supplied by Cooper or manufactured by the customer. The cartridge houses the bearing and seals. For any given size of bearing there are two main types of cartridge: The standard cartridge - up to 300 mm / 12” shaft size - featuring a groove in each end bore that can accommodate felt seals (supplied as standard with the cartridge), high temperature packing or a rubber lip seal. Above 300 mm / 12” shaft size the standard cartridge features grease groove seals. The North American standard cartridge (also available worldwide). This is the ‘triple labyrinth’ (TL) type, which accommodates either an aluminium triple labyrinth (ATL) seal or - on certain sizes - a neoprene triple labyrinth (NTL). 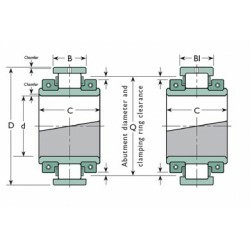 ATL and NTL seals are not supplied with the cartridge and must be ordered separately. Cartridges to accommodate other types of seal, such as lip seals for submerged conditions, and combinations of seals, may require special machining. They may also have a different length on shaft to the standard types listed. Cartridges for fixed (GR) and expansion (EX) bearings are different, so special care must be taken when ordering and fitting. Cartridges for GR bearings feature drillings for ‘side screws’ that locate the outer race against one side of the seating, while cartridges for EX bearings may include additional internal machining.Click here for compatible bearings for this cartridge. 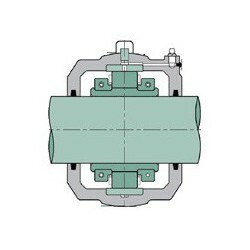 Most Cooper split roller bearings are mounted in a cartridge. This is a spherically-machined inner housing that can be fitted into a number of outer housings including pedestals, flanges, rod-ends, take-up units and custom housings either supplied by Cooper or manufactured by the customer. The cartridge houses the bearing and seals. For any given size of bearing there are two main types of cartridge: The standard cartridge - up to 300 mm / 12&rdquo; shaft size - featuring a groove in each end bore that can accommodate felt seals (supplied as standard with the cartridge), high temperature packing or a rubber lip seal. Above 300 mm / 12&rdquo; shaft size the standard cartridge features grease groove seals. The North American standard cartridge (also available worldwide). This is the &lsquo;triple labyrinth&rsquo; (TL) type, which accommodates either an aluminium triple labyrinth (ATL) seal or - on certain sizes - a neoprene triple labyrinth (NTL). ATL and NTL seals are not supplied with the cartridge and must be ordered separately. Cartridges to accommodate other types of seal, such as lip seals for submerged conditions, and combinations of seals, may require special machining. They may also have a different length on shaft to the standard types listed. Cartridges for fixed (GR) and expansion (EX) bearings are different, so special care must be taken when ordering and fitting. Cartridges for GR bearings feature drillings for &lsquo;side screws&rsquo; that locate the outer race against one side of the seating, while cartridges for EX bearings may include additional internal machining. Most Cooper split roller bearings are mounted in a cartridge. This is a spherically-machined inner housing that can be fitted into a number of outer housings including pedestals, flanges, rod-ends, take-up units and custom housings either supplied by Cooper or manufactured by the customer. The cartridge houses the bearing and seals. For any given size of bearing there are two main types of cartridge: The standard cartridge - up to 300 mm / 12” shaft size - featuring a groove in each end bore that can accommodate felt seals (supplied as standard with the cartridge), high temperature packing or a rubber lip seal. Above 300 mm / 12” shaft size the standard cartridge features grease groove seals. The North American standard cartridge (also available worldwide). This is the ‘triple labyrinth’ (TL) type, which accommodates either an aluminium triple labyrinth (ATL) seal or - on certain sizes - a neoprene triple labyrinth (NTL). ATL and NTL seals are not supplied with the cartridge and must be ordered separately. Cartridges to accommodate other types of seal, such as lip seals for submerged conditions, and combinations of seals, may require special machining. They may also have a different length on shaft to the standard types listed. Cartridges for fixed (GR) and expansion (EX) bearings are different, so special care must be taken when ordering and fitting. Cartridges for GR bearings feature drillings for ‘side screws’ that locate the outer race against one side of the seating, while cartridges for EX bearings may include additional internal machining.